We have received a gold medal and two silver medals at the International Wine Competition of Thessaloniki 2016 where more than 500 wines were tasted blind. The award winning wines are Lefkada-Shiraz 2013, Zambartas Marhatheftiko 2014 and Zambartas Rosé 2015. 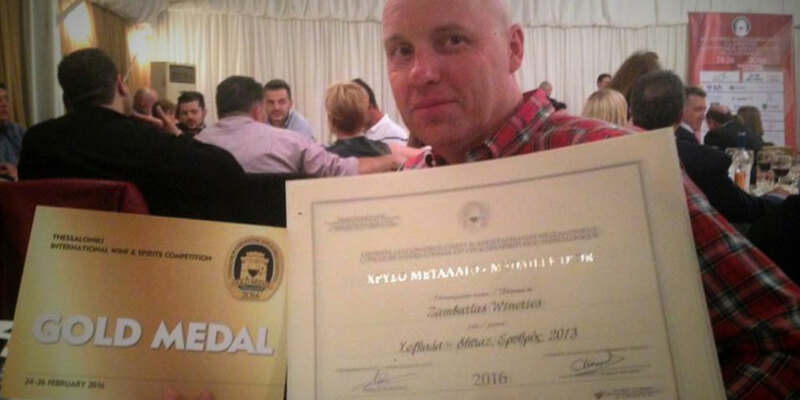 It is the 3rd time in a row that Zambartas winery receives a gold medal during this competition. Marcos adds: ‘It is always a nice feeling to see team effort being recognised and rewarded. The cooperating vinegrowers and all the colleagues have worked hard for these awards and I thank them. It is worth mentioning that Cyprus won a significant number of medals with wines at very competitive prices’. Picture: Our dear friend Alex Copper represented us at the gala awards dinner in Athens and received the medals for us.